Each of the murals will be telling a specific part of our local history, brought to life by experienced mural artists from all over the world who, by using their own distinctive style, will be creating a unique work of art; a Masterpiece if you like. As a Master Sponsor your company’s name will be connected to one of these Masterpieces. Your contribution will enable us to realise one complete mural. A good, solid primer is an essential part in the creation process of a mural in order to assure its longevity. As a Prime Sponsor your contribution will supply a similar foundation for the Sussex Mural Project as a whole, which will enable us to create works of art of only the highest quality. For a great idea to become a reality, a good work plan is a necessity. For a good work plan to become a success, dedicated associates are indispensable. As an Associate Sponsor your support will help us to achieve the highest level of success for the Sussex Mural Project. Classic stands for timeless, lasting value and distinctive. Classic is what we envision for the murals to become, in every sense of the word. As a Classic Sponsor you will be contributing towards the achievement of this goal. Many people already have expressed their ‘friendship’ towards the Sussex Mural Project. We hope to make even more mural friends, who will become our ambassadors and will help to get more people aware and enthusiastic about the project. for school classes, organizations, clubs etc. With the Adopt a Mural option we hope to get the youth of our community involved in the project. The Sussex Mural Project is of great educational value. By means of a specific form of art, accessible to everybody at any time, various parts of our local history will be made visible. We hope this experience will instill civic pride, community spirit and create a sense of ownership. School classes, organizations, clubs etc. can Adopt a Mural of their choice for 1 year. During this time the group will look after their mural by means of removing litter from the sidewalk, removing snow that covers the mural, reporting any damages on the murals and be ambassadors for all the Sussex murals in general. To download a PDF version of our sponsor packages Click Here. 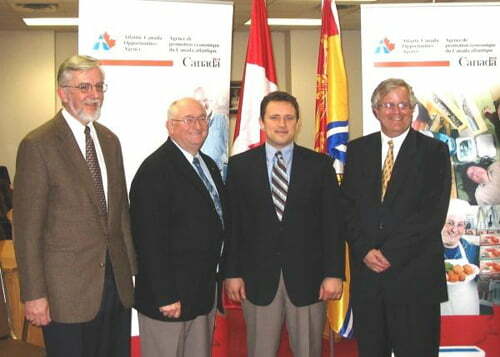 Rob Moore, MP Fundy Royal, announced federal funding under the Innovative Communities Fund toward the Sussex Mural Project. 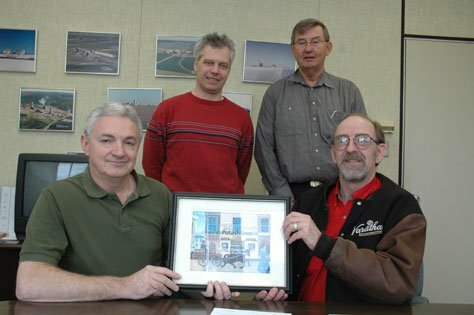 The PotashCorp has received a Master Sponsor designation when they presented $ 10,000 to the Sussex Murals Project. We are very pleased that the PotashCorp has chosen to support our project. They are allready one of the biggest employers in our area and are now again giving our area’s economic development a significant boost with this contribution.A project of this magnitude would not be possible without the support of the community. Every painted work of art is signed by its creator, and by means of their very generous support, Sussex Home Hardware Building Centre has put a significant ‘signature’ on this project. Sussex Home Hardware Building Centre donates Beauti-Tone primers and paint for all of the murals, as well as their valuable expertise with regard to paint advice. With this contribution we can be assured that all murals will be realised with materials of the highest quality and will have a long life. Each of the murals is telling a specific part of our local history, brought to life by experienced mural artists from all over the world who, by using their own distinctive style, will be creating a unique work of art; a Masterpiece if you like. CN is a leader in the North American rail industry. Following its acquisition of Illinois Central in 1999, WC in 2001 and GLT in 2004, as well as its partnership agreement with BC Rail in 2004, CN provides shippers with more options and greater reach in the rapidly expanding market for north-south trade. CN has one of the best operating ratios in this industry and is committed to moving more freight, more quickly and with fewer assets. CN is the only railroad which crosses the continent east-west and north-south, serving ports on the Atlantic, Pacific and Gulf coasts while linking customers to all three NAFTA nations. CN revenues derive from the movement of a diversified and balanced portfolio of goods including petroleum and chemicals, grain and fertilizers, coal, metals and minerals, forest products, intermodal and automotive. Dairytown Products Ltd. is eastern Canada’s largest industrial milk processor. Located in Sussex, New Brunswick, Dairytown Products processes more than 60 million litres of milk annually into world-class butter and milk powder products. Dairytown Products has been the recipient of many national awards for its fresh-churned butter. Most recently, the Dairytown brand of butter was judged Best Butter in Canada at the 2006 Royal Agricultural Winter Fair in Toronto. In March 2004, the Dairytown brand of butter was judged World’s Best Butter at the World Cheese & Butter Championship held in Madison, Wisconsin. Dairytown supplies its award winning butter and milk powder products to leading food processors and grocery retailers throughout Canada. Dairytown Products is ISO 9001 registered and was the first food processing plant in eastern Canada to receive the HACCP accreditation by the Canadian Food Inspection Agency. Dairytown Products and Mrs. Dunster’s received a Master Sponsor designation when they presented $ 10,000 to the Sussex Murals Project. 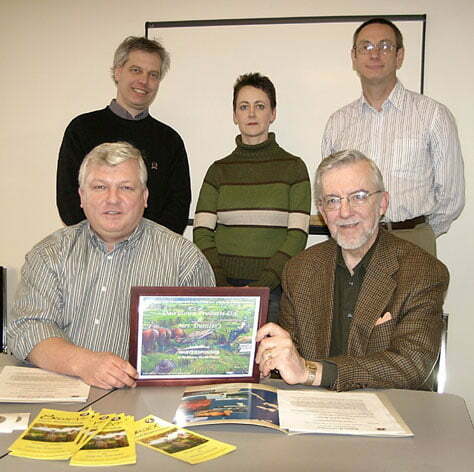 Back (FLTR): Mural committee members Rob Gulmans, Ann Ophaug and Frank Tenhave. Made according to a time-honored recipe developed by Ingrid Dunster, Mrs. Dunster’s donuts truly look and taste homemade. There is nothing ordinary about a Mrs. Dunster’s donut. Prepared using pure lard and double-sugared for extra sweetness, Mrs. Dunster’s donuts are in fact “apple-shaped” and unlike conventional donuts… they don’t have a hole! 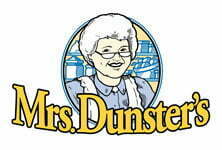 Mrs. Dunster’s produces more than a million packages of donut products each year. These are widely distributed throughout the Maritimes and Maine. In many areas, these donuts have a near “cult” following. We receive numerous requests each year (from as far away as Texas and California) from visitors who have tried our donuts and are not able to purchase them at their local store. A truly iconic symbol of New Brunswick, Mrs. Dunster’s donuts offer homemade taste in every bite. PotashCorp is the world’s largest fertilizer enterprise, by capacity, producing the three primary plant nutrients – potash, phosphate and nitrogen. Chief among these is potash, “the quality nutrient”, which improves the taste,texture and nutritional value of food. In addition to fertilizer, PotashCorp produces animal feed supplements for livestock and industrial products used in everything from soft drinks to medicine. To improve socio-economic well-being of our communities. PotashCorp received a Master Sponsor designation when they presented $ 10,000 to the Sussex Murals Project. Back (FLTR): Mural project manager Rob Gulmans and PotashCorp H&R superintendant Lionel Dann. The contribution of our Prime Sponsors will supply a similar foundation for the Sussex Mural Project as a whole, which will enable us to create works of art of only the highest quality. Bethany Bible College – a fully accredited college affiliated with The Wesleyan Church – offers high caliber programs of study uniquely focused on preparing men and women for Christian ministry. The Bethany experience is a highly effective integration of faith and learning based on dynamic spiritual transformation, academic excellence and effective leadership development. All of these are a vital part of our mission – Preparing World-Class Christian Leaders For Ministry. Amsterdam Inn is dedicated to serving its guests to a unique experience. We offer travelers all the comfort of a home away from home at a price you can afford. We are Canada Select rated 3.5 star accommodations. Quaint well maintained retro-motel on 3-acres with matured pine trees. All rooms drive-up, picnic tables, close to major highways and dining facilities nearby. Rated 2.5 stars and we offer bilingual (French, English) service. The support of our Associate Sponsors will help us to achieve the highest level of success for the Sussex Mural Project. Classic stands for timeless, lasting value and distinctive. Classic is what we envision the murals to become, in every sense of the word. The contribution of our Classic Sponsors will assist us towards the achievement of this goal. Relax and slowly sip a delicious cup of tea with cherished friends in an enchanting place. Fabulous fresh cuisine, homemade soups, delectable desserts. Listed in “Where to eat in Canada” 1989-2007.